Ukraine will be at the top of the agenda when the leaders of the G7 advanced economies meet later this week in Brussels. Their deliberations are likely to focus on what their governments – Canada, France, Germany, Italy, Japan, the United Kingdom and the United States – can do to bolster the newly elected Ukrainian government in the face of continued violence by pro-Russian sympathizers within the country. But the effectiveness of any such Western aid may depend on fundamental reform of the Ukrainian economy, which is mired in recession. 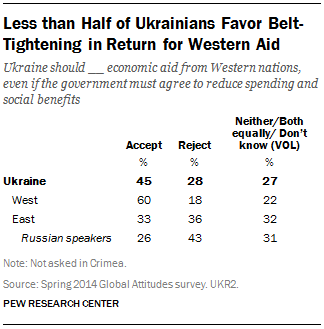 Support for belt-tightening in return for aid is particularly low among Ukrainians ages 50 and older. Just 41% are willing to accept any such bargain. But more than half (53%) of younger Ukrainians support a trade-off. The Ukrainians’ lack of enthusiasm for economic aid comes at a time when their economic outlook is bleak. The Ukrainian economy is expected to contract by 5 percent this year as the country faces an overvalued exchange rate, a substantial budget deficit, and big losses in the energy sector that have put Ukraine on a “highly unsustainable course,” according to a recent International Monetary Fund report. To help Ukraine reverse economic course, the IMF has already approved a $17 billion emergency rescue package that unlocks an additional $15 billion in international financing, including loans and other funding from the U.S., Europe and the World Bank. In return, the government in Kiev has agreed to substantially increase both retail gas and heating prices, 56 and 40 percent in 2014, respectively, and 20–40 percent in 2015–17. It will cancel pension and public sector wage increases planned for this year and freeze public sector hiring. It will abandon a planned cut in the sales tax, hike duties on diesel fuel and impose new sales taxes on pharmaceutical and medical products. But such reforms have a history of foundering in Ukraine. In the past six years, two previous IMF-supported economic restructuring efforts have gone off track. So while the geopolitics of Ukrainian aid may dominate G7 discussions in Brussels, it may be the regional and ethnic politics of additional austerity that determine whether such assistance ultimately proves successful.